Live dealer casinos are becoming increasingly popular among gamblers for their immersive and realistic nature. Many online casinos in the UK now offer the opportunity to play casino games with live dealers. Essentially, live dealer casinos offer players give players the chance to feel as if they are playing in a land based casino from the comfort of their own home. This article will discuss how live casinos work, and the pros and cons of playing at online casinos with live dealers. Live casinos offer a convenient way to play games with a live realtime dealer without having to visit a land based casino. Players are able to interact with the dealer in the same way they would in a land based casino. Interaction is made possible by the use of live chat where players are able to type instant messages to send to the dealers. Live casino games work in the same way as regular casino games, live dealer roulette and live dealer blackjack are played in the same way as they would be traditionally. The only real difference between live dealer games and computerised versions of table games are the limits that are sometimes placed on the minimum and maximum bets. Live casino games also often take longer than computerised table games. Trust – Live dealer casinos are favoured by many people that have an issue trusting the randomness of computerised casino games. 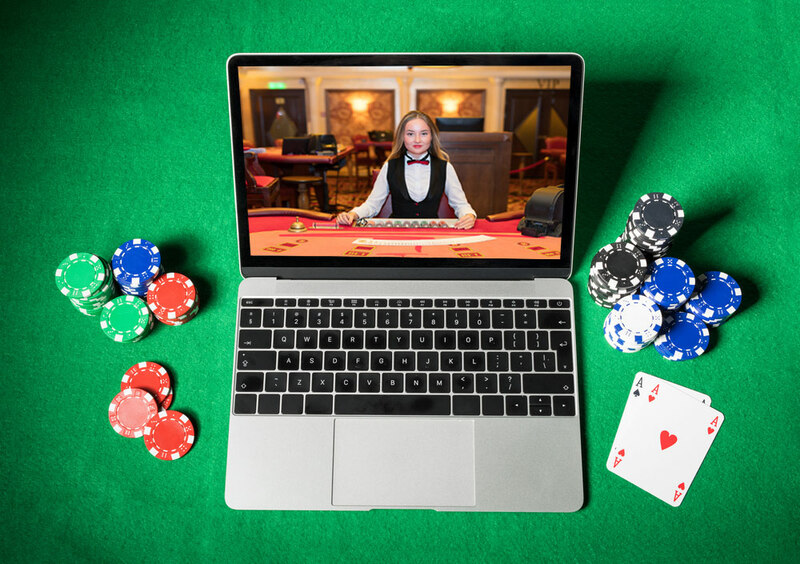 A live dealer casino completely eliminates these concerns, as players are actually playing on a real casino table that is streamed to them in realtime via webcam. Interactive Play – Dealer interaction is a huge part of live casino games, this aspect makes the experience more immersive, and is great for those that are looking for a more social way to play. The live chat feature means that players can take part in discussions with other players and with the dealer. The Rules Don’t Change – Another advantage of live dealer casinos is that the rules of the games do not change. For example, live casino blackjack follows the same rules as any other blackjack game, as does live casino roulette. This means that players that are familiar with the rules of any game in a live casino can test out a live version of the game without having to learn anything new. It Can Be Slow – If you’re a fan of fast play, then live casinos probably will not be for you. Many aspects of the game can have an impact on the speed of play, these include having to wait for the dealers to deal cards or spin a roulette wheel. Additionally, you also have to wait for other players to place their bets before each round starts. Availability Of Tables – Each live casino only has a certain number of tables available, these tables also have limits that restrict the numbers of players on each table, meaning sometimes tables will be full. Waiting for a table can be irritating, particularly if you are looking for a quick gaming experience. Minimum Bet Limits – Live casinos usually only offer games with higher minimum bet limits than computerised table games. For example, most computerised casino games will allow players to bet small amounts like £0.10 and sometimes less, live casinos on the other hand will usually have a minimum bet of £1.00 or more. This isn’t ideal for players that like to conserve their bankroll. Live casinos have both their advantages and disadvantages, playing at online casinos with live dealers is the closest thing you’ll find to playing in a land based casino. Arguably, playing online does offer many things that a land based casino doesn’t, such as the ability to use a variety of payment methods, small minimum bets, and playing in a comfortable environment. Live casinos are in a sense a mixture of what online play and land based play have to offer. Depending on your preference, live casinos may be a great way to enhance your online gambling experience. However, if you are a player that enjoys betting little and often, it may be best to stick to computerised table games.